Electrochemical cells for hydrogen generation, energy storage, and electrokinetic water purification systems. Such systems necessarily involve the chemical conversion of a reactant to one or more products driven by the applied chemical potential. We propose a new concept in electrochemical cell operation that has the potential to dramatically change the way such processes are designed and implemented in practice. Molecular separation membranes for water purification (polyimide/polysulfone) or proton selectivity (Nafion) have traditionally consisted of high dielectric constant, low electrical conductivity materials. Recently, atomically thin 2D electronic materials are emerging as impressive nextgeneration membrane materials. These materials, which include graphene and transition metal dichalcogenides (TMDCs) have electronic properties ranging from metallic to semiconducting, expected to have enormously high molecular fluxes of gases, and with carefully engineered pores are expected to have excellent selectivity for molecular transport. In this work, we explore the use of 2D electronic materials such as MoS2, graphene and their hybrids to develop selective transport membrane electrodes. Gas phase formation on electrodes is known to have negative effects on electrochemical processes by reducing effective areas for current. Such technology would find immediate application in barrier-less fuel cells and photoelectrochemical cells, water purification and battery technologies, as well as sensors and MEMS devices. Our plan is divided into four main aims: (1) develop and theoretically explore an integrated mathematical framework describing both molecular transport with and without an applied electrochemical potential, accounting for chemical reaction and selective diffusion, (2) explore optical and electrical properties of 2D materials such as graphene, MoS2, and their composites using various characterization tools including scanning probe microscopy, (3) explore experimentally the transport properties of membranes with engineered pores (4) perform combined transport and electrochemical experiments to understand the interplay between molecular transport through such barriers under the influence of electrochemical potential. 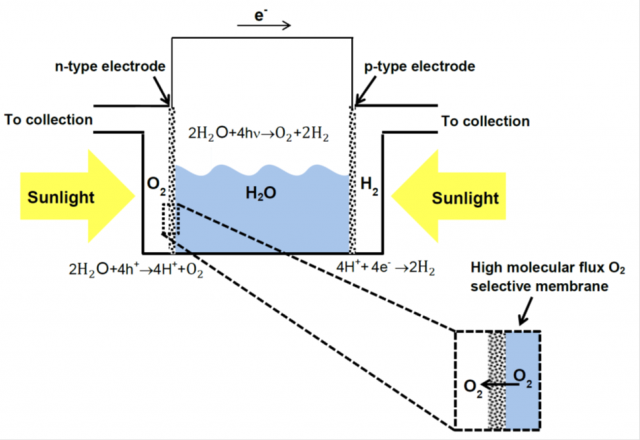 Our model reaction for consideration is water electrolysis to form hydrogen and oxygen, because this chemistry is central to applications in hydrogen generation, solar energy conversion and water purification/desalination.